I saw the TED talk by Tony Robbins and did not know him before then. It was an impressive talk, but it also seemed a little weird. Now I’ve seen this documentary I find those two feelings remain, just clearer then before. 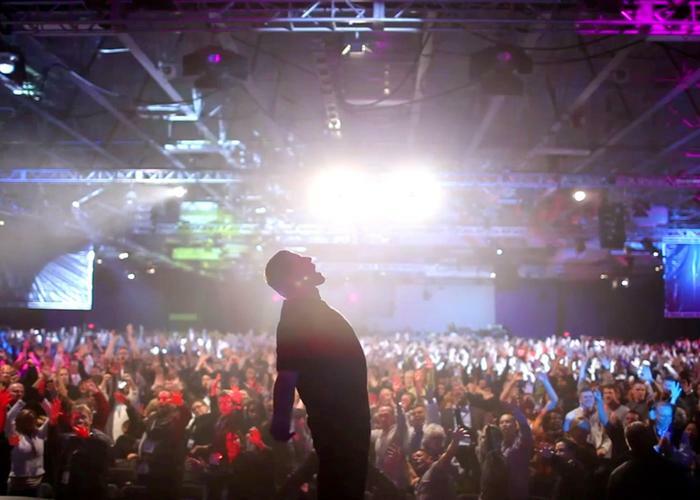 The movie shows Robbins during a week long seminar/event on self improvement with 2500 people. A few exemplary cases are picked to show how Robbins successfully transformes the lives of his clients, or rather helps them to transform their lives themselves. I’m a sceptic about the whole concept of self improvement. I don’t think we should go through our lives constantly thinking about arbitrary ideals that we’d like to achieve. Sure you should try to become better at whatever you do, but the idea of a strictly goal-oriented life of achievements does not appeal to me. But maybe that’s just me. The movie focuses on interviews with Robbins, his team and the audience (so to speak) but kinda ignores all the obvious and subtle mechanisms Robbins uses to stage a life-changing experience. He sure knows how to draw a crowd, and he repeats his urge to help time and time again. However, if what he does is not about staging a guruesque figure, I don’t know what is. Sure, taking those people out of there daily lifes to reflect on it and connect them with new people, that’s no magic or fraud, and it can do wonders. But why Robbins charismatic show is in any way fundamentally different than a church visit or visiting a self help group still escapes me.